In 2013 we introduced the Grand Stevie Award trophy, which is awarded to only a handful of organizations in each of our six competitions. 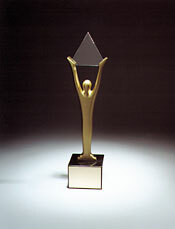 In each Stevie Awards competition, the top scoring qualifying entry in each category is awarded a Gold Stevie. Finalists that receive a final average score of at least 8.0 out of a possible 10 are designated as Silver Stevie winners. All other Finalists are designated as Bronze Stevie winners. Gold Stevie winners automatically receive a Gold Stevie trophy. Silver and Bronze Stevie winners automatically receive a Silver or Bronze medal, signifying their win, and have the option to purchase their Stevie trophy.